Who would have thought that a property as harmless as Ghostbusters would have ever divided movie going audiences like this? Paul Feig’s upcoming remake of the comedy classic has drawn a line in the sand, with many people furious about the prospect of such an iconic film getting a remake. It’s unclear exactly why so many people hate the idea of a Ghostbusters remake, but it seems that Judd Apatow has possible theory regarding the matter. Here at Cinema Blend, we like to discuss movies. It’s what we love and it’s what we do. With that in mind, we’re not going to get into the nitty gritty political details of Judd Apatow’s statement. Having said that, it’s abundantly clear that he believes that the people who doubt the quality of the upcoming Ghostbusters remake likely have a very conservative view of the world. We highly doubt that they're all Donald Trump supporters, but Apatow clearly sees some sort of correlation there. Regardless of your political affiliation, there's a certain degree of validity to his assessment of the situation. Much of the vitriol aimed at the upcoming comedy seems to take issue with the gender swapping of the lead characters and its lack of reverence for the original ensemble. There seems to be a distinct sense of anger because the film appears to have made the four titular heroes women simply for the sake of doing so. In the eyes of the haters, it's the sort of decision that comes across as needlessly progressive or politically correct, and that's the sort of social issue that conservative candidates like Trump have taken aim at in recent months. All that being said, we have to say that we think the level of hatred that the Ghostbusters reboot has received is entirely unwarranted. As Judd Apatow explains, there’s such a high degree of modern comedic talent working on the film, both behind the camera as well as in front of it, that it likely won’t disappoint when it finally hits theaters. 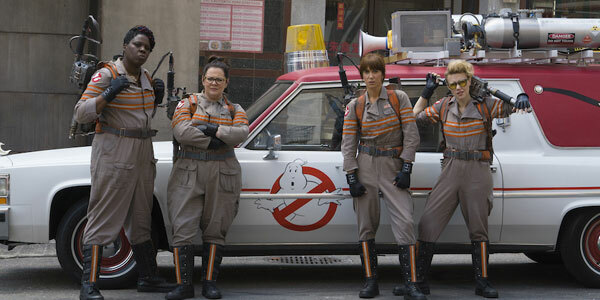 What are your thoughts on the upcoming Ghostbusters remake? Are you excited about it, or do you think that this is a property that should be left alone? We will find out if Paul Feig and the new generation of Ghostbusters can pull this off when the film finally hits theaters on July 15.